When you think of wool felting, you probably envision fuzzy woodland creatures or little teddy bears made from craft store kits. 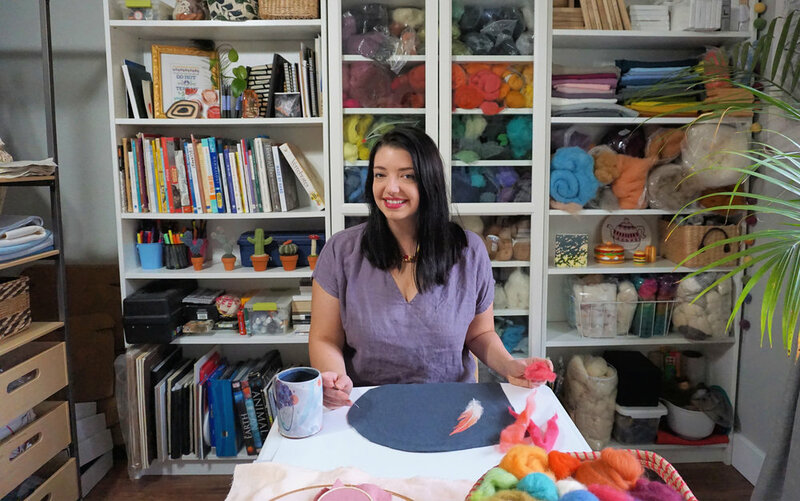 While these projects are cute, Dani Ives has elevated felting from a craft store project to a true work of art. Her colorful, intricate, and life-like pieces capture the beauty of nature as she paints with wool on a canvas of felt, linen, velvet, or burlap. Progress shot and completed portrait. As demand grew, she created online classes complete with supply kits. “When I began felting I realized that starting with the right products is so important. I also found that sourcing high quality materials from ethical farms was a challenge so I’ve worked with my suppliers to create an easy starter kit for people interested in giving this art form a try.” Her book, Painting with Wool, officially launches in March of 2019 and will showcase 16 beautiful projects you can make at home. For more information, and to stay connected to Ives as she makes special announcements and offers custom pet portraits, sign up for her newsletter at www.daniives.com.